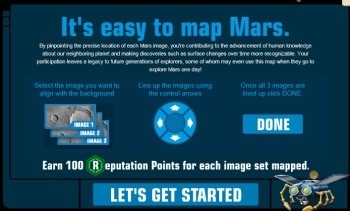 The devious minds at NASA have developed a new way to turn the minds of our children to their nefarious "research" by creating an online game that lets them take part in the process of mapping the surface of Mars. A joint effort between NASA and Microsoft, the "Be a Martian" website gives kids (and adults, too) a chance to learn more about Mars, with the opportunity to ask questions about the red planet and vote on which are most interesting to readers, some of which will be answered online by experts. Movies and other interactive tools with a wide range of information about Mars are also available. But visitors to the site can do more than just learn about Mars, they can also help with the ongoing exploration effort through two separate programs. The first, Map Mars, has users place and align three high-resolution images of the Martian landscape on a lower-resolution background, which will eventually create a seamless, "deep zoom" image of the surface, while the second, Count Craters, helps geologists determine the age of small areas of the planet, which will hopefully provide clues to its development and history. "We're at a point in history where everyone can be an explorer," said Mars Exploration Program Director Doug McCuistion. "With so much data coming back from Mars missions that are accessible by all, exploring Mars has become a shared human endeavor. People worldwide can expand the specialized efforts of a few hundred Mars mission team members and make authentic contributions of their own." The site is obviously aimed at kids but don't let that fool you: This stuff is hard. I had to try four times before I found a map with overlays I could actually handle and I'm still not entirely sure I got it right. Same thing with counting craters; it sounds simple enough but trying to tell the difference between a crater and a shadow or a rock or a dead Martian on a low-resolution black-and-white map isn't easy. For each successful mapping mission, users earn 100 "Reputation points" and Badges are awarded for completing specific numbers of missions. Exploitation of Mars Global Surveyor-sized loopholes in child labor laws notwithstanding, it's a pretty cool idea; NASA gets some free research, kids get to screw in time on the computer and parents don't have to feel guilty about letting them do it. Everybody wins!